I was staring out our kitchen window this morning, taking in all the beautiful spring green around the farm. I’ve already mowed the grass twice, and many of the trees are in an advanced stage of leafing out. After the warmest March on record, nature seems to have tapped the breaks with the return of evening frost warnings. Spring fever hit me hard this year. I recognize with seasonal temperatures back in the 40’s, that getting out the shorts and sandals, was indeed premature; but I just couldn’t help myself. It begins with all those little seeds. The brief burst of warm weather did allow us to get a jump on a few things. Our land has been tilled for spring planting and we have our garlic, beets, carrots, lettuce and spinach planted. 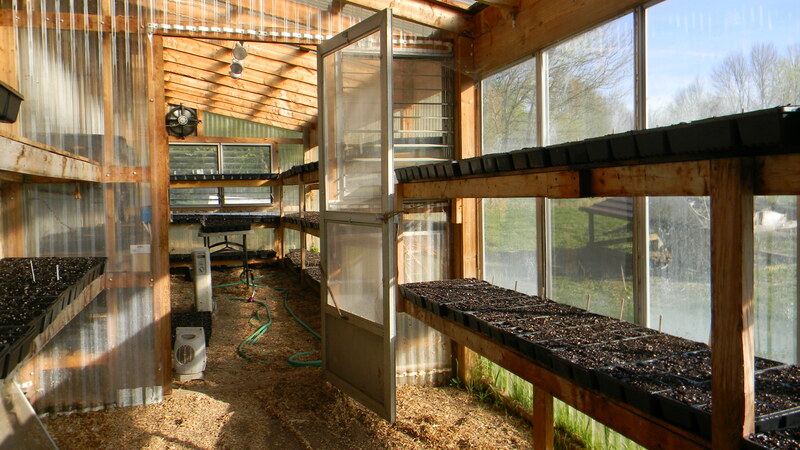 Our greenhouse is filled with over 8100 tomato seeds, along with peppers, herbs and cabbage. It’s hard to believe that market starts in less than a month! It will be interesting to see all the new renovations that have taken place during the winter months. We are labeling soaps during rainy days, and are trying to get more time in the shop for making spoons and salt cellars for something new this year. But the thing that keeps me going right now is the dream of warm days to come. I am anxious for three things: garlic, tomatoes and basil. As a foodie who loves growing food, life would be a little empty without the sweet, pungent, aromatic taste of those three things. For me it borders on a religious experience. We are almost through our stock of sauces, pesto and salsa. As much as I enjoy using all those wonderful homemade foods, nothing will ever beat fresh. When the tomatoes are on, I will eat them for breakfast, lunch and dinner with a smile on my face and a song in my heart. BLT’s, uncooked tomato sauce, caprese salad, gazpacho, salsa, bruchetta and pesto are all on the menu for summer eating in the screened-in porch with lake breezes and good friends. In the mean time I will practice being in the present with the beautiful Swiss chard from our hoop-house. My two favorite ways are sauteed and topped with a poached egg or combined with garlic-cream and pancetta for Swiss chard casserole. My brother-in-law who “hated” Swiss chard had seconds, twice. Preheat oven to 400 degrees. Butter a shallow 5-6 cup ceramic gratin dish. Melt 1 Tbsp of the butter and toss it with the breadcrumbs; set aside. In a medium saucepan, bring the cream and garlic to a boil. Lower heat and simmer for 5 minutes, reducing the cream to about 3/4 cup. Season with salt and pepper. Meanwhile, in a 12 inch nonstick skillet, cook the pancetta over medium heat until crisp and browned. Drain on paper towels reserving 1 Tbsp fat in skillet. Add the remaining 1 Tbsp butter to skillet and melt. 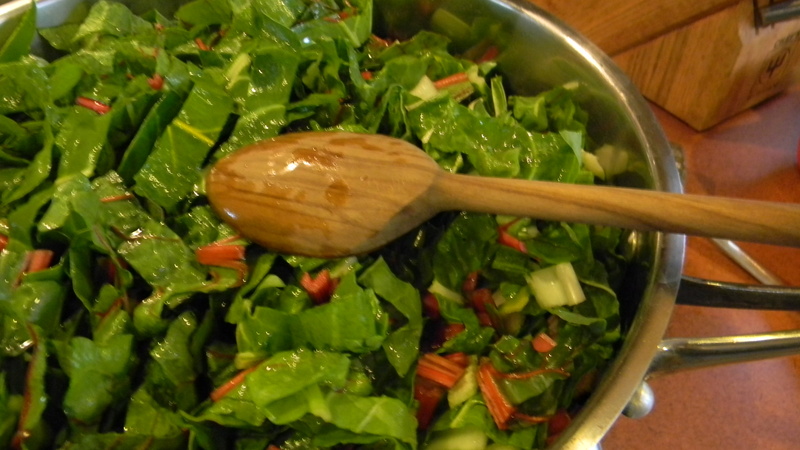 Add the chard stems and saute over medium heat until they are soft and slightly browned, about 10 minutes. Add chard leaves. Saute about 2-3 or until wilted. With tongs, transfer the contents to gratin dish, leaving any excess liquid in skillet. Spread evenly. Sprinkle pancetta over chard. Top with pecorino cheese. 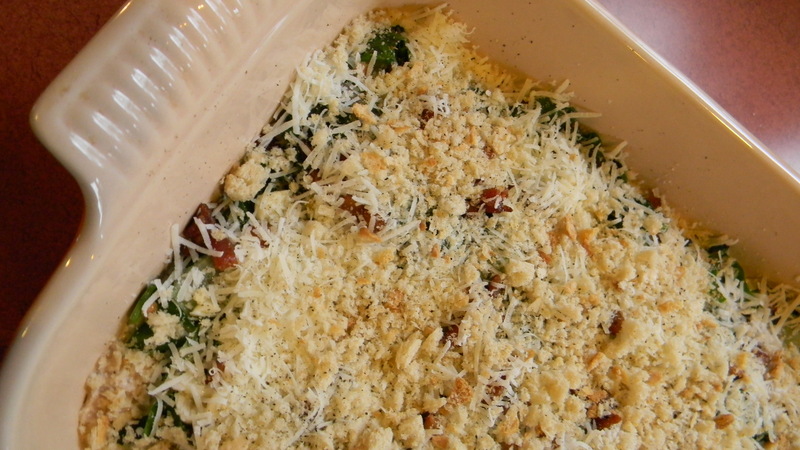 Pour the seasoned cream over all and top with buttered breadcrumbs. Bake until golden and bubbly, about 25 minutes. Let stand for 10 minutes before serving. 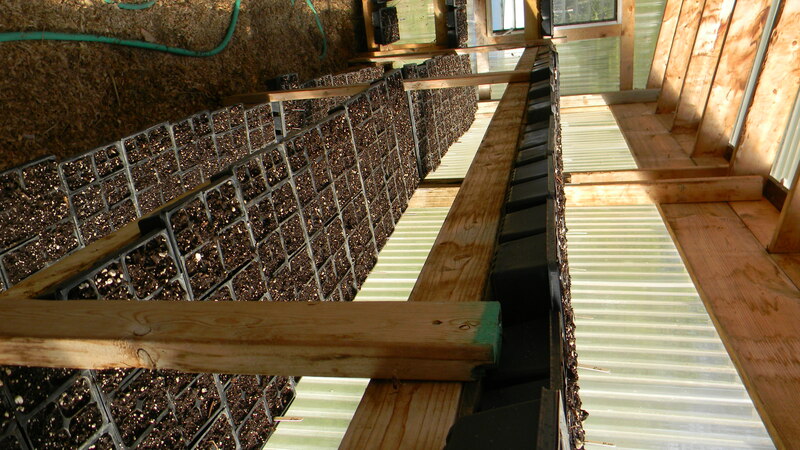 This entry was posted in Farm News, Recipes, Vegetables and tagged brickyardfarms, farm, food, garlic, greens, locavore, recipes, spring, tomatoes, weather. Bookmark the permalink. I was reading your blog and I noticed all these “?s” where pictures should have been. I then hit on one of them and it brought me to your web page with full pictures. Is this what you wanted to happen? i enjoyed reading them both but liked the one with pictures more:-) Hope the weather is kind to you this week. Hey Jude, No that’s not what I wanted! Word Press was having problems the night I posted, so I’m not sure what happened. Better luck next time :D!